In late 2015, Capterra surveyed 400 POS buyers and users online to compare how people buy and use point of sale (POS) software. Underlying the whole industry is a single type of platform- Point of Sale (POS) software. POS runs a store from end to end - that is, from the time that a product is first added into inventory, to the time that it is sold. The POS even keeps track of everything around a sale and can produce thousands of datapoints about your salespeople, your customers, and how every sale occurred. It's an incredibly powerful software. In recent years, as eCommerce websites have truly become a force to be reckoned with, brick and mortar stores have been hard pressed to remain profitable. Stores have begun to experiment with “showrooming,” where they keep a small amount of inventory on hand to show to customers, and potentially sell on the floor, but maintain the bulk of their sales through the internet. As the tides shift like this, companies are learning how to utilize their point of sale software differently. We wanted to understand just how the retail industry was changing in reaction to burgeoning eCommerce popularity and emerging sales technology. This POS software research report found trends clearly indicating a move to web-based software with a strong focus on mobile use. 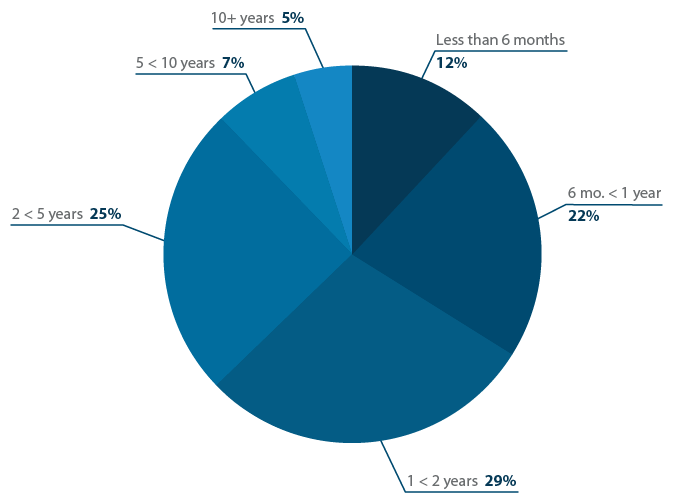 88% of companies have had their software for less than 5 years. 44% of all stores use mobile POS. 79% of those users are small-midsize businesses. 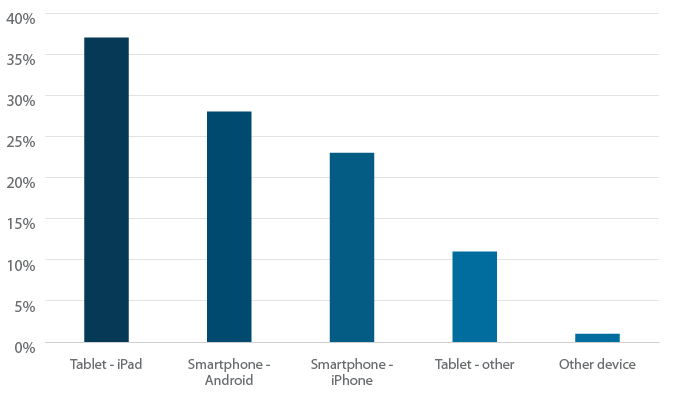 iPad is the preferred device to run a mobile register on, but Android is the preferred smartphone. 46% of companies spend less than $1,500/year on their POS software. 37% of companies spent more on their software than they budgeted for. The feature that retailers most desire in their POS is zero transaction fees. Following that, most retailers also desire a mobile management app, and built-in employee scheduling capabilities. POS software is used by a wide variety of business types and sizes, not just retailers. Which size companies use POS? Again, POS software is used across all revenue bands - after all, anyone making a sale needs the software. 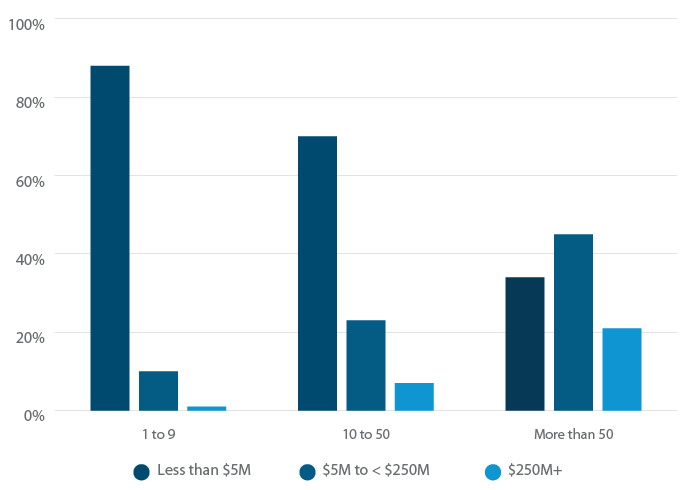 70% of our respondents had revenue of under $5 million, but that is likely due to the fact that there are simply far more small businesses in the U.S. than enterprise businesses. The abundance of cheap and free POSs mean that even the tiniest kiosk in the mall can afford to run software. What is the average number of products stores have? What is the average number of registers stores have? What POS Software Do People Use? Retailers are favoring newer cloud-based POS software brands that allow them to use their software on devices less clunky than standard registers - like iPads. What are the most popular software brands? Our respondents favored Quickbooks, Square, and IBM most, which matches to some extent what our definitive list of the Top 20 Most Popular POSs says. Quickbooks is the #1 most-used solution in the world, and Square and IBM are both in the top 10 most used. Given that we received many responses from small-medium sized businesses, seeing these three software solutions at the top makes a lot of sense. Both Square and Quickbooks cater to small-mid size businesses, while IBM works best for medium-level businesses (up through enterprise-level). Do they prefer using web-based or installed software? 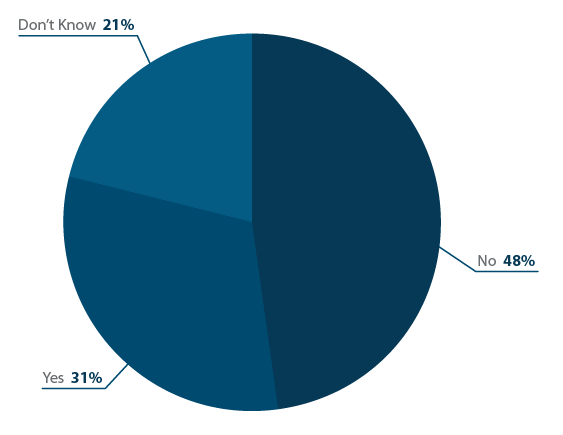 Like many a presidential election, only a narrow majority of users prefer installed software. However, once you start digging into the data, these numbers start to tell a far different story: while installed software is currently the more preferred option for POS, it won't be for long. 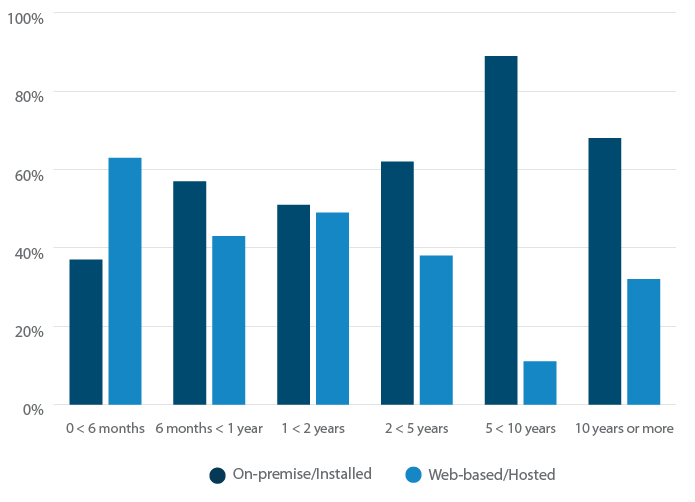 When you look at installation by length of software use, there's a very clear trend showing newer software purchases are more often web-based. Web-based software has many benefits for retail companies - making the use of mobile POS possible, or allowing managers to check on reports remotely, for instance. These applications make web-based software not just trendy, but incredibly useful. Will installed software ever be obsolete? Hard to tell. But the day is certainly coming when web-based POS systems are the default and people only use installed POSs for very specific reasons. How long have companies been with their current POSs? For companies using POS who aren't retailers, swapping POS software is likely fairly simple since only a very small part of their business utilizes that software. The POS industry itself is going through a huge shift. Many solutions are becoming cloud based, and are offering the ability for companies to use their software on mobile devices. As this happens, companies may find that their solutions no longer fit them when the solutions update. Other companies may be on solutions who don't update to SaaS, and switch providers to go to one that is cloud-based. Finally, as this shift occurs, many new software solutions are becoming available and companies may find that these solutions are better for them. This is well reflected in that fact that Square is the fifth most popular POS solution in the world, and it's only been in business for six years! How long companies have been with their current POSs broken down by revenue band. 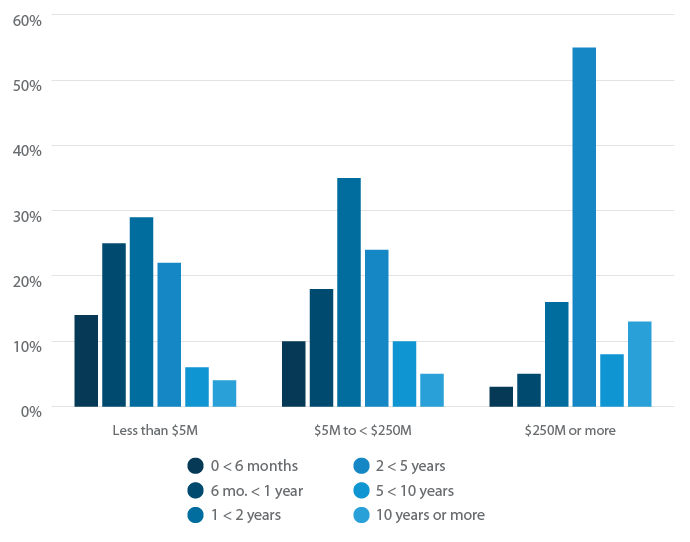 When broken down by revenue band, it's clear that larger companies have been with their software for an average of 2-5 years, while small-mid size companies are likely to have been with their software for only 1-2 years. This speaks to the fact that it is far more cumbersome for larger companies to swap software, while small and mid-size companies are flexible enough to change out their software more often for solutions that suit them better. 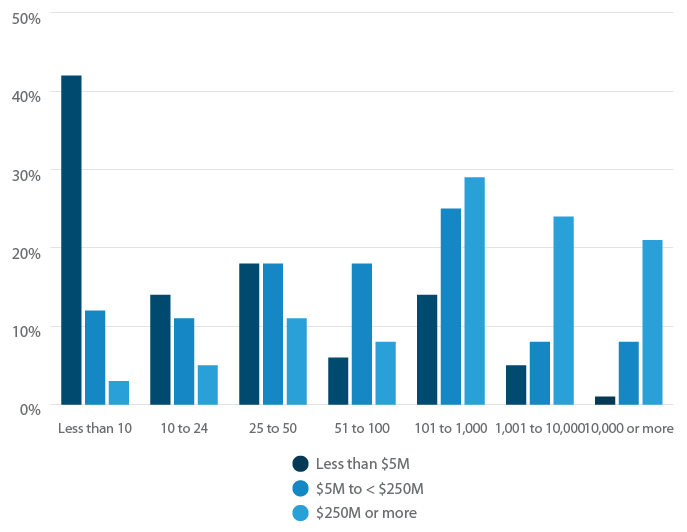 Very small companies (under $500,000 in annual revenue) are more likely to have been with their software for less than a year, probably because many of them are start-ups where everything, including the software, is brand new. Have companies had other software previously? Because of the high percentage of responses we received who said they did not know if their company had had different POS software previously, it's difficult to make much of this data. 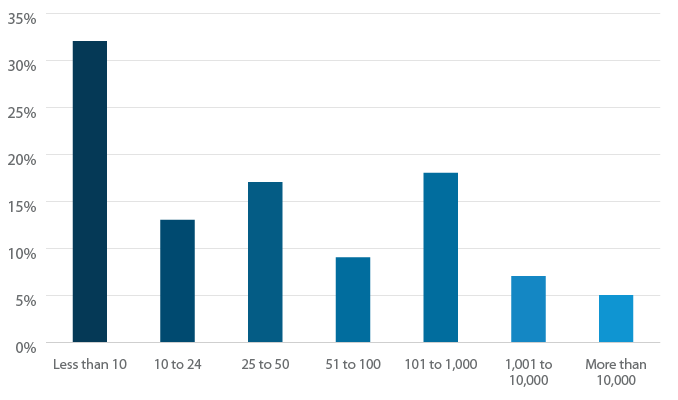 It's possible that a very slight majority of companies are second generation users; but it's also possible that an overwhelming majority of users are first gen. One other possibility is that the unknowns breakout the same as the knowns with a roughly 5:3 ratio of ‘nos' to ‘yeses', which would similarly push the number of companies that are first gen users above 50% - which is impressive! Why did companies switch their solutions? For most companies who switched from a previous POS, it seems that the straw that broke the camel's back was whether or not their POS had the features they needed. The next-most serious consideration for switching was that the POS vendor provided poor customer support. Interestingly, both these considerations beat out the price of the software, suggesting that companies are willing to pay more for a solution that has great customer support and all the features they need. How long do companies keep their POS hardware? 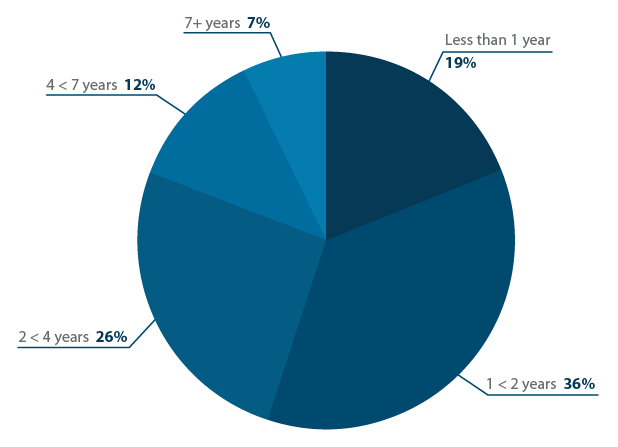 An overwhelming majority of companies (81%) have had their hardware for less than four years, with a full 55% percent of those companies having had their hardware for less than two years. 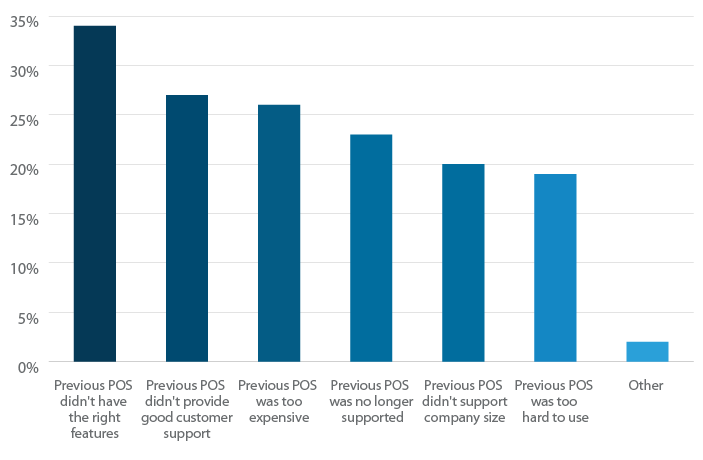 55% percent of companies have had their POS hardware for less than 2 years!Tweet This What's interesting here is that, while on the surface those numbers seem very similar to length of POS software usage, there are some significant differences. 34% of companies report purchasing software within the past year, but only 19% of companies have bought hardware in the past year. The gap begins to close as we move to the next bucket, but there's still a distinct difference: 29% of companies report purchasing their software 1-2 years ago; 36% report purchasing hardware 1-2 years ago. Those numbers even out at the 2-5 year mark, though. These discrepancies suggest that companies purchase their hardware at a slightly different time than their software. It may be that some companies first purchase new hardware thinking, perhaps, that the slowness in their software is caused by the hardware, only to discover post-purchase that the software is out-of-date and still needs to be updated. Other companies may have the opposite experience, and purchase new software first, only to discover it doesn't run as well on the old hardware. What's the Deal With Mobile POS? If you know anything at all about the POS industry, you know that mobile POS (POS run on a tablet or smartphone that can be used anywhere with internet access) is the hippest thing on the block right now. 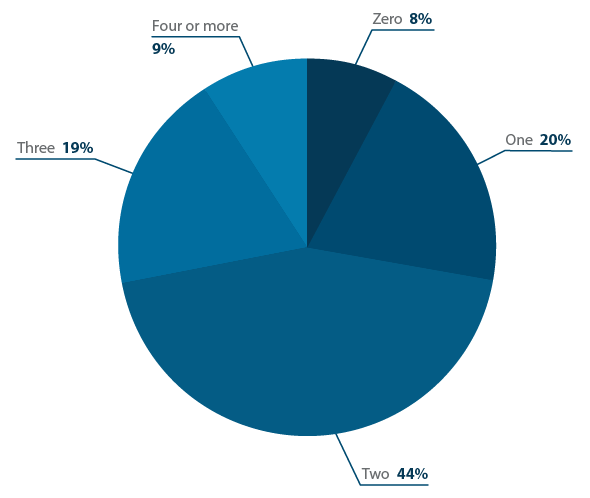 How many stores actually use mobile POS? 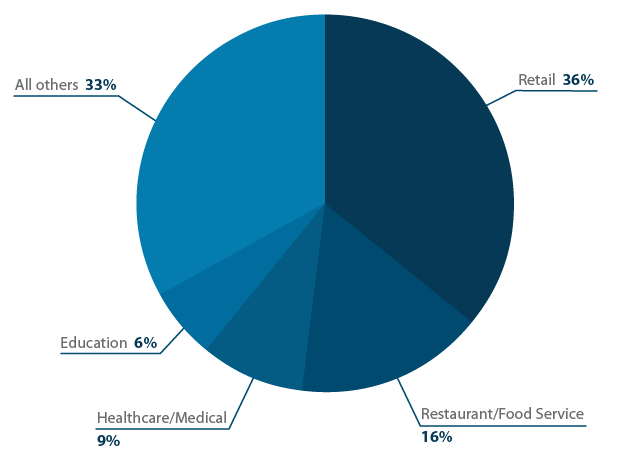 Stores that use mobile POS broken down by revenue band. 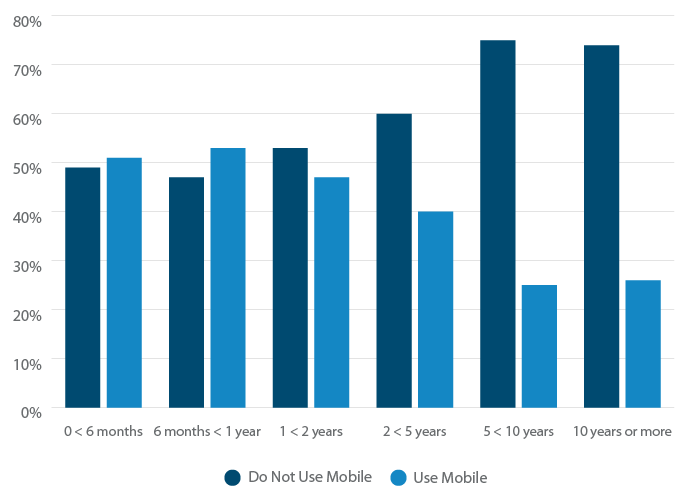 79% of mobile POSs are used by small-mid size companies doing less than $10 million in sales, while only 21% are used by large businesses.79% of mobile POSs are used by small-mid size companies!Tweet This This makes sense for several reasons. First, it's more difficult for larger businesses to implement new technology, as it requires a much bigger change than in a small business. Second, most POS brands who sell to small companies are heavily pushing mobile POS. Many of them also sell the hardware accessories to turn a tablet into a fully working register. Square, one of the most popular POSs for small businesses, was founded only a few years ago as a company that exclusively sells mobile POS. Because of this focus, and the relative low cost of a POS add-on for an already-owned mobile device (Square gives theirs away for free to new customers), it makes sense that companies looking into these POS brands would come away with at least one mobile register, if not multiple. Further supporting this hypothesis is that there is a clear correlation between length of software ownership and mobile capabilities. 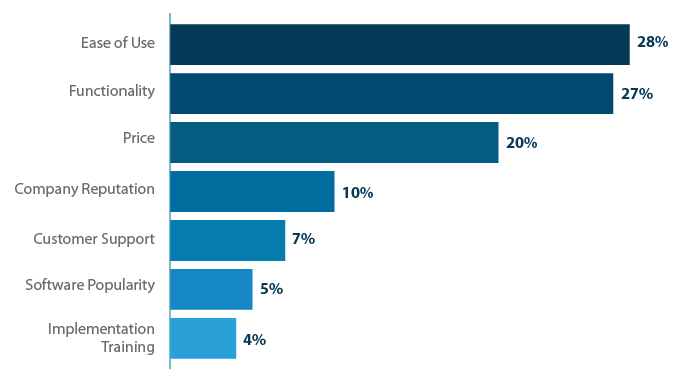 The chart below shows that those who have recently purchased POS software are more likely to also have mobile POS functionality, while those that purchased their software two or more years ago are more likely to not have mobile registers. In fact, there's a very clear drop-off after purchasing over five years ago, in particular. Stores that use mobile POS broken down by length of use. Relatedly, mobile POS is typically cheaper, both in software and hardware costs. Software tends to be cheaper because the solutions pushing forward with mobile the most are created and priced for small businesses. Hardware, though, is cheaper as well. Tablets cost far less than a desktop computer, and stationary registers also require the architectural design to support them. A mobile register requires no built-in cash wrap, so a very minimal cash wrap is not a problem. A minimal cash wrap not only costs less to build, but also allows for more floor space, which is a boon in a tiny store. The more room you have to display products, the more sales you can make. What devices do stores run their mobile POS on? In a surprising twist, though, Android is the preferred smartphone for use as a mobile register by a somewhat narrow majority. This is likely due to the fact that Android is simply the more popular brand of phone, so store owners want to use the device that they're already comfortable with. How Do Companies Choose Their POS Solution? When choosing their POSs, companies come in surprisingly close to what they expected to spend both in money and time! How long does it take to find the right solution? 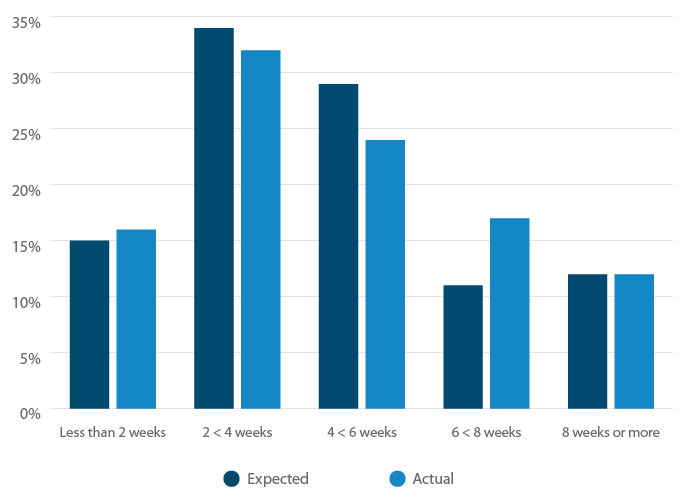 56% of companies find their solution in 2-6 weeks of searching,56% of companies find their POS within 2-6 weeks of searching.Tweet This which is fairly close to the 63% who expected to find their software within that timeframe. The 7% discrepancy can be easily explained: 6% take 6-8 weeks to find their solution, and 1% take only 0-2 weeks! Given this, people are more likely to underestimate how long it will take to find a POS, but only by a little. 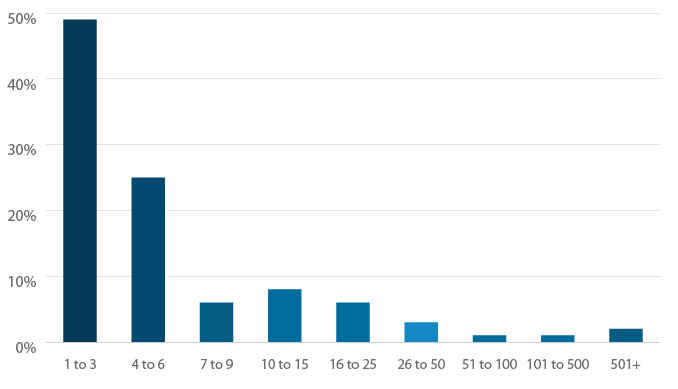 How many demos do users do before purchasing? 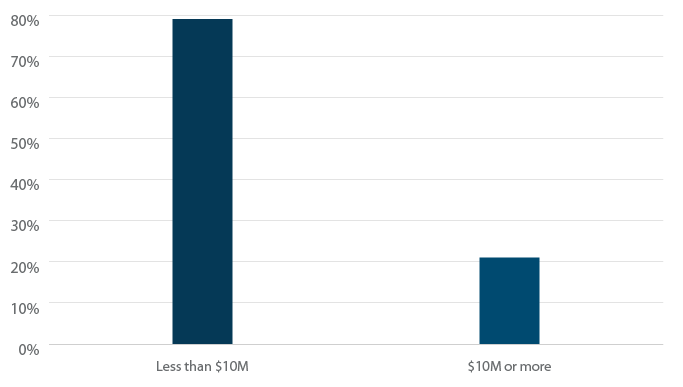 The majority of companies do two or fewer demos, which is lower than in other software verticals we've researched. This could mean POS buyers are more educated, as a whole, before buying, or that because POS is a less costly purchase than, say learning management software, the risk to doing fewer demos and making the wrong decision is less. A surprising and brave 8% elected not to do demos at all, and a scrupulous 9% did four or more demos. 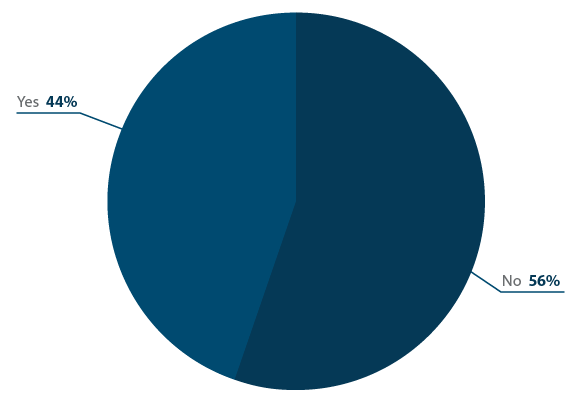 Overall, regardless of the number of demos done, users seem to be satisfied or at least neutral towards their software. 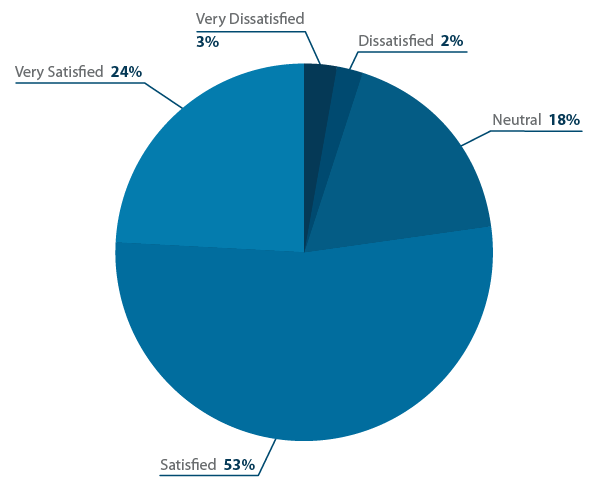 How satisfied buyers are broken down by the number of demos they ran. It's likely that satisfaction goes down after people do three or more demos not because they haven't picked the best option out there for their company, but because they know what else is out there. Essentially - it's rare for a solution to be able to do everything you could possibly want it to do, and the more demos you do, the more likely it is you will end up picking a tool but wishing it had that one feature from another solution. How Much Did Companies Spend? 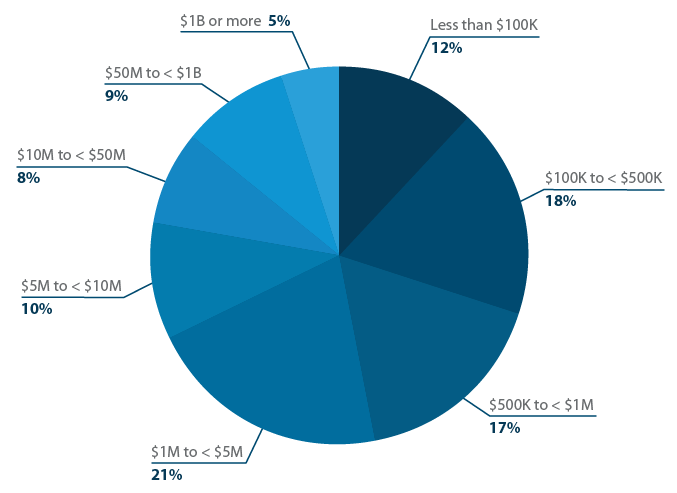 51% of companies spend between $900-$5,000/year. 46% spend between $0-$1,500. 46% of companies spend between $0-$1,500 annually on their POS.Tweet This Only 22% spend more than $5,000/year, so a full 78% of vendors are spending $5,000 or less a year on their software, making POS an affordable software for even the smallest stores. An interesting note is that 40% of POS buyers spend exactly what they budgeted for, but nearly the same amount (37%) spend more than they budget for. Only 24% spend less. Given that a full 60% of buyers under or overestimate what they'll be spending, it seems like POS vendors are not doing enough to really educate buyers ahead of time about pricing. How Did They Purchase Their Software? Overall, companies were looking, first and foremost, for a software that was easy to use. What considerations impacted the purchase decision? Companies are most concerned with their software's ease of use, closely followed by functionality. Price comes in as a distant third concern, which supports my earlier theory that companies will pay more for a vendor that offers them the support and functionality they desire. An interesting note, though, is that price is a more important consideration for POS buyers than buyers of eCommerce software, despite their similarities. 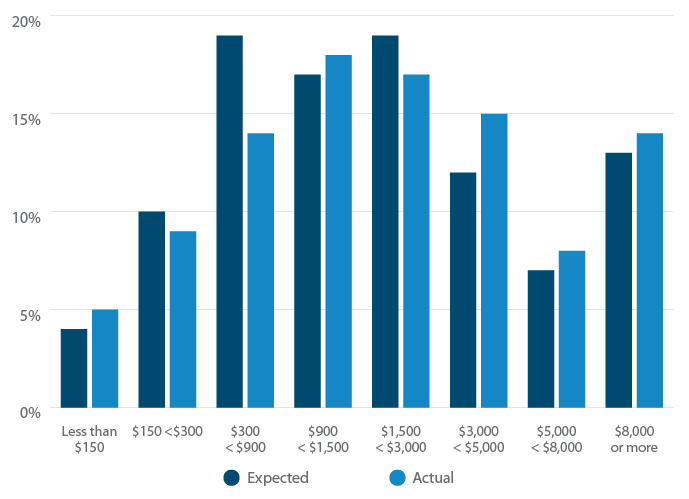 Ecommerce users put even vendor reputation above their budgetary concerns. How long did it take to implement the software? 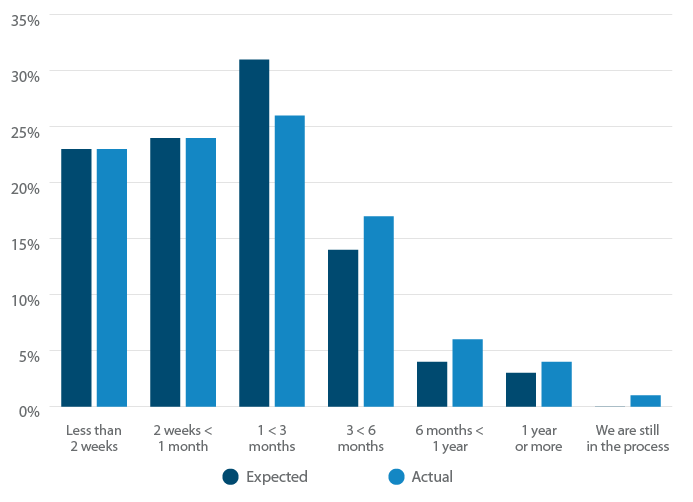 Companies, on average, take about two weeks to three months to implement their software, and it does appear to take slightly longer to implement than most respondents expected. Intuitively, the bigger the company, the longer it takes to implement the software. How Do People Think About Different POS Features? In keeping with the desire for easy-to-use software, POS users most value features that make their lives easier - zero transaction fees, management apps, and customized reporting. What are the most desired features? Overall, the features that companies most desire to have in their POS are zero transaction fees, followed by a mobile management app. It's not unsurprising that zero transaction fees would come out on top - no transaction fees automatically saves retailers tens of thousands of dollars (or far more). Customized reporting and inventory control are neck and neck for the most used features, which is not very surprising considering that most POSs are used to run a store from end to end - that is, from inventory purchase and storage, to ringing sales and analyzing sales numbers. Thus, reporting and inventory features are heavily relied upon. The fact that 24/7 support is so well used is also not surprising, in light of the earlier revelation that a vendor's customer support is one of the most important purchase considerations for POS users. 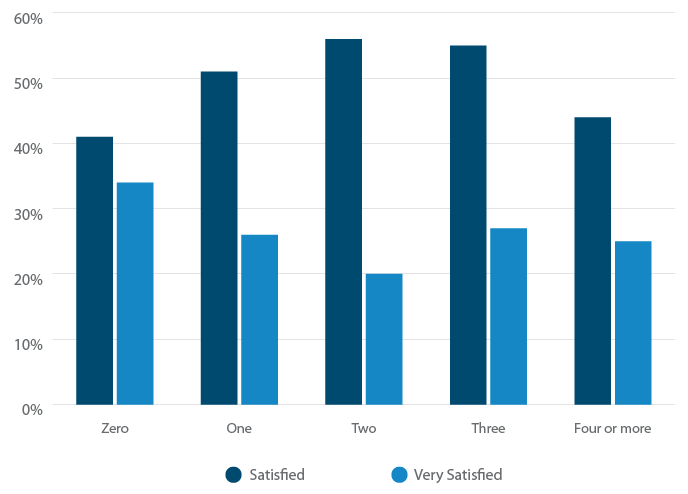 Are Companies Satisfied With Their Software? Overall, companies are pretty happy with their software. 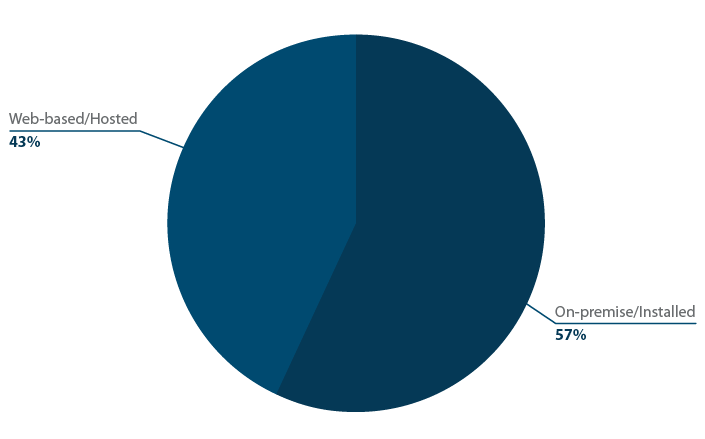 A pretty incredible 77% of users are satisfied or very satisfied with their POS software! 77% of users are satisfied or very satisfied with their POS software!Tweet This This number tracks pretty closely with the results in other software industries. Many other studies we've conducting show that users of other types of software are satisfied about 70-80% of the time. However, this satisfaction rate is a full 11% lower than the satisfaction rating for POS's sister software, eCommerce. 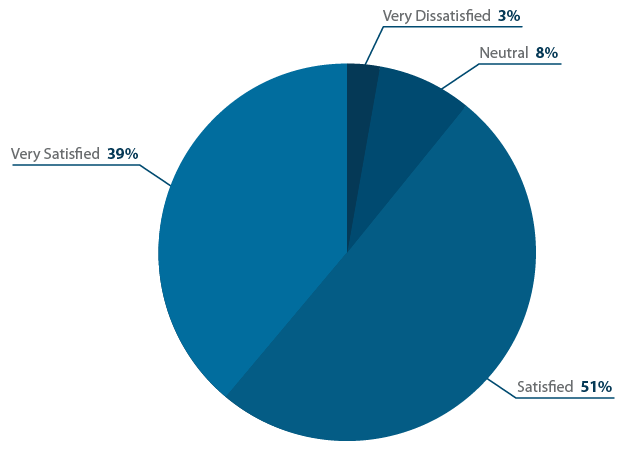 As you can see, eCommerce users seem to be far more passionate about their software, whether in terms of “very satisfied” or “very dissatisfied” - there are no regularly dissatisfied people, and 10% fewer people than the POS respondents are neutral about their software. Even in the retail industry, where it's used to run a store from end to end, it is still not the store - it's a tool. So for those two reasons, POS users may be inclined to be more apathetic towards their software, or more inclined to put up with a software they don't necessarily love. For an eCommerce user, their software can quite directly make or break their business. 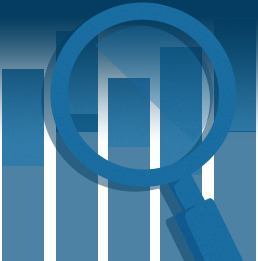 Capterra's POS software research highlights how companies utilize their point of sale software from what they think is important in the software to what they're willing to pay for it. As stores move into the future, they've begun trending toward web-based, mobile POS to keep up with the changing pace of retail. These web-based, mobile POSs will allow greater omnichannel connectivity for companies who are choosing to showroom. They also allow for a far better customer experience, as mobile POS brings the point of sale to the customer, rather than forcing the customer to find the point of sale. 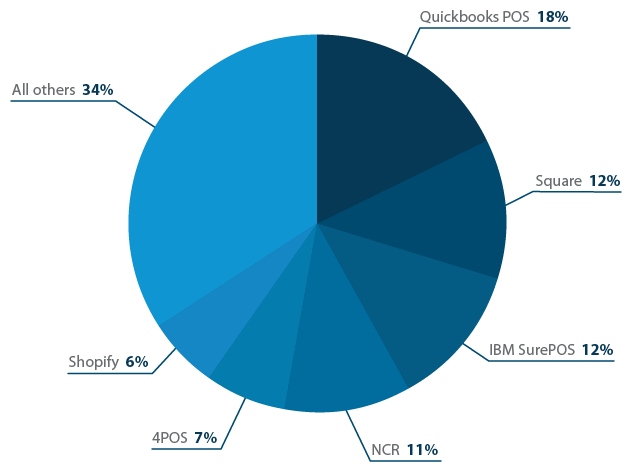 Capterra collected the data in this POS systems report through a 26 question survey to POS buyers and users online, conducted over the course of a week and receiving a total of 400 qualified responses, in September 2015. Cara Wood is a marketing associate at Capterra and a graduate of Mary Washington! When she's not hard at work at Capterra, she can be found horse-back riding, reading, and just generally having a good time at life. Follow her on Twitter @carodare.